You may say I’m a dreamer, but I’m not the only one . 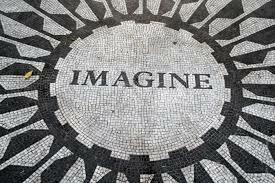 . .
As we enter our 13th year at The Pink Fund, I am thinking about the John Lennon song, Imagine. In the summer of 2005, while in treatment for early stage breast cancer my mind began to imagine and dream about forming an organization that would provide Real Help Now & One Less Worry to women and men in active treatment for breast cancer. I knew from my own experience that the loss of income and mounting medical bills created huge stress for me and my family. And that those financial burdens left me feeling hopeless until by quest to Get Help became one to Give Help. When I shared my dream of creating a fund that would pay non-medical basic cost of living bills to patient’s creditors for housing, transportation, utilities and insurance people looked at me like I was delusional. In retrospect I can understand why. I had recently rescued my home from foreclosure, while continuing to pull out the cancer card every 58 days when Ford Credit called to inquire as to when they might expect payment. Not only that, I was standing in line monthly in the basement of a local church’s food pantry to help feed my family, and I didn’t have a job or any savings. Personally I was financially bereft. Clearly, I was not thinking clearly. But here’s the thing, I believed I could do this and that belief so empowered and energized me to make a difference, that the reality of my circumstances were overshadowed. Fast forward to October 2018, The Pink Fund is a national organization having paid out $2.9 million in bills to patient’s creditors. We are part of two corporate partnerships with Ford Warriors in Pink and Snap-on Tools, and looking for more who want to join us. We’ve conducted two surveys on the financial burdens breast cancer patients face and have learned that 41% skip treatment due to costs and 37% lose their jobs, permanently. We’ve recently studied young survivors, whose financial burdens are exponentially greater, the results paint a startling picture of the devastating financial toll a battle with breast cancer can take on younger patients who have not yet built up adequate financial reserves to mitigate myriad out-of-pocket expenses associated with battling the disease – and who will have to fight and monitor the disease for a longer period of time. You can access the full study findings here. And we are in early stage conversations about an academic study, using our data to understand the long term financial burdens of the disease, and hopefully identify ways in which we can intervene and provide more help. This is my new dream, that YOU will join us.